Reduce costs, save space and improve environmental protection with Multiple Hole Bushings for any Remke cord grip, in any size or material. MULTIPLE HOLE BUSHINGS ARE AS VERSATILE AS THE PROBLEMS THEY SOLVE! The Remke family of Multiple Hole Bushings are the answer when several cables need to be terminated into one single cord grip. You’ll reduce costs, save space and improve environmental protection with the flexibility you get with multiple hole bushings from Remke! Over 600 configurations are ready to ship in standard neoprene or high-temp silicone, and couple with ANY cord grip from Remke, in any size and material, including aluminum, nickel-plated aluminum, steel, stainless steel, nylon or Valox®. With fewer connection points, multiple hole bushings reduce potential problems and the number of cord grips needed. They are also an affordable alternative to cable entry systems! 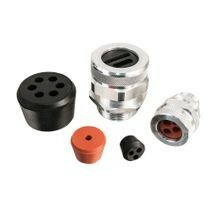 Ideal for confined spaces where maneuverability can be difficult, multiple hole bushings give you more room to work effectively. Neoprene or silicone bushings provide inherent sealing in harsh applications and, when coupled with a wire mesh grip, multiple hole bushings provide additional strain relief! Click to learn more about the benefits and applications for multiple hole bushings. Used in a variety of industries for its extreme temperature properties and chemical resistance, silicone is an excellent electrical insulator. Silicone composition makes it highly resistant to ozone, UV and heat. Industries that benefit from silicone rubbers include automotive, medical devices, aviation and aerospace, electronics, construction and industrial. Remke Engineered Solutions is entirely focused on meeting the needs of a single customer. Our Job #1 is to develop application-specific, custom multiple hole bushings that meet precise specifications.